Much was made last year of Swansea's Mark Gower being deemed to be 'The most creative player in Europe' ahead of the likes of Messi, Silva and Rooney. The original story which started it off talks about how this is an example of 'Moneyball' with statistics being able to identify lesser known players who punch above their weight. The reality may not be quite as impressive but there's still something to suggest that Gower offers something different. The stat was taken 10 games in to the season but Mark had only played in 6 of those, making it easier to maintain a high average. 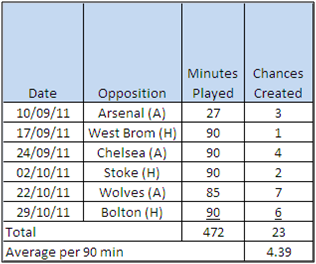 As he'd only played 472 minutes in this period, the 27 minutes against Arsenal where he'd created 3 chances (equivalent of 9 over a match) had a far bigger impact that someone who had played in all 10 games. 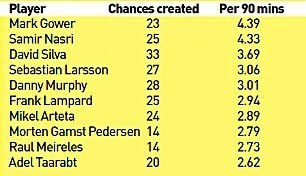 Also, the two big performances in terms of chances created were against two teams that ultimately would be relegated (Wolves and Bolton). By the end of the season, Gower had created 36 chances in the 1127 minutes played (2.87 chances per 90 minutes) which although a long way from 4.39 was still the second highest at the club by some distance. Gylfi Sigurdsson was top with an average of 3.0 per 90 minutes but him and Gower had almost double the average of any other players, although this was partly due to these two taking the bulk of set piece activity over the season. Whilst the above might take some of the shine off Gower's accolade there's still some merit in highlighting Gower's ability to pick a pass and the fact that he had the most assists at Swansea (5) despite only playing the an equivalent of a third of the season. So often when teams are chasing games late on, the tactic is to throw more strikers on, sometimes putting on a player who can make the right pass when defences are sitting deep could be the better tactic and Gower arguably fits the bill.